I love your tablescape and this chocolate treat looks so yummy. Kitty, I'm glad you are enjoying cooler weather and can sip your tea outdoors. Those bars would be perfect for a football game too :-) Have a nice week. Oh they sound really yum. Pleased your weather is cooling down a bit, ours was quite a bit warmer today. I spent most of the day outside doing a bit of a tidy up. Nice for a change. Your teacup from Debbie is so pretty and those treats sounds so good.They are a must try! 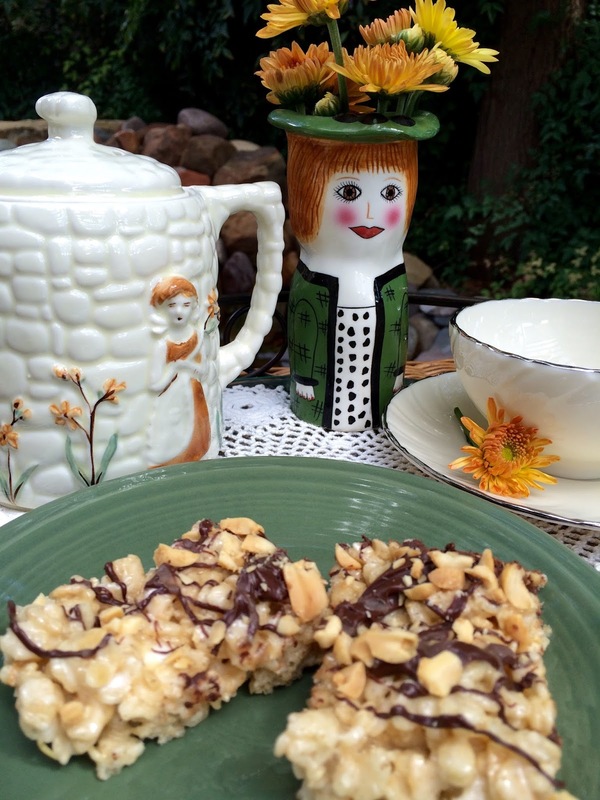 I love rice krispie treats, and this version sounds super yummy! 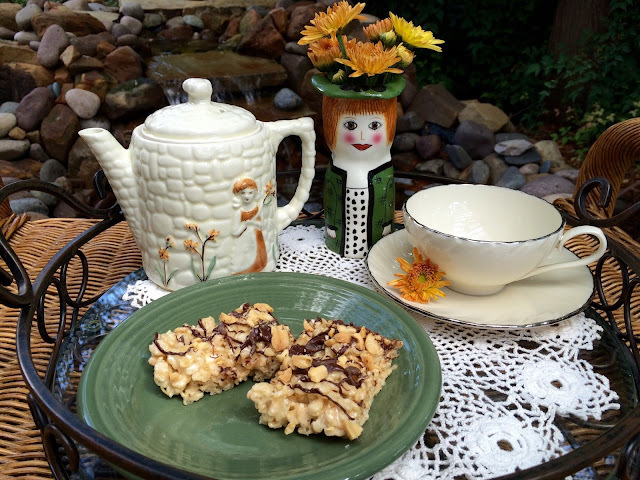 Rice Krispie Treats are always a favourite with everyone. The caramel would make them extra yummy. I love your beautiful teacup and it goes so well with your teapot too. The vase is cute holding the mums. I think you and I are so much alike, Kitty, because I cry at weddings too. Babies being born, always brings a tear to my eye. Thank you for joining me for tea and enjoy your week, dear friend. Your lady vase sure goes perfect with that darling teapot. Rice Krispie Treats are sure a win - win and even with adults to satisfy the sweet tooth! So glad you shared Kitty! Rice Krispie Treats for adults is a winner with me!!! The teacup & saucer are very pretty and elegantly simple especially coming from sweet Debbie! Your Lady Vase is so cute...I've never seen one before!! Your super cute lady vase made me smile, Kitty! We've also experienced a temperature drop here. This morning when I went to work, it was only 6 degrees Celsius. Brrr! We went from 36 C to 6 C in just one week. Yikes! 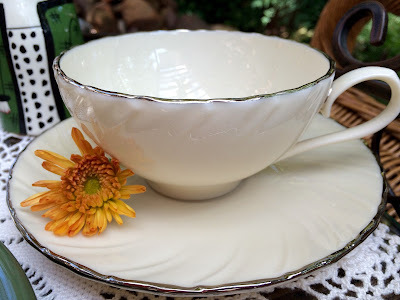 Love your white Lenox teacup--it'll go well with anything! Oh Kitty, your tea time should be a spread in a magazine - it's so pretty for autumn! Oooh Kitty~ You have just hit a soft spot with me! I love love love crispies with caramel, or maybe I should say that I love caramel with anything. Here we are another exchange under way, isn't it exciting!? I so look forward to these exchanges. I'm so blessed to have met you through Stephanie's tea cup exchange, you are dear to my heart, Kitty. My gang loves Rice Krispie treats so I'm sure they'll go for these...except I'll have to do a small batch for Ms. C. who doesn't care for nuts. Either way, I know they'll be delicious. Thanks for the recipe. The tiny tablescape is just so sweet...very autumnal. It has cooled off here, too, thank goodness! Wow, I love this post! The tea-pot, tea-cup and the lady vase are so beautiful! Funny, you are glad the weather has cooled off, but here (Holland) it is windy, rainy, dark and cold. Hi Kitty, What a pretty fall inspired table setting. Love your pretty Lenox teacup from Debbie. Gorgeous lady vase too. Thank you for sharing the recipe. It looks so delicious. They look so good! Hope all is well there! Very summery here still. I'll take it, don't want to think about another frigid winter and snow yet! Kitty, that teacup & teapot are adorable! And your treat bars look so delicious. Thank you for sharing the recipe with us. Yummy yummy! Isn't Debbie such a sweetie? Love the beautiful teacup. I like the sound and the look of grown up marshmallow treats, they would be a nice treat for afternoon tea. I'm glad I joined Stephanie's teacup exchange this time, she's a lovely lady. Oh this has my mouth watering and I have everything to make it! Yum, can't wait to try it. I just love peanuts and chocolate and marshmallow. These look wonderful Kitty! I love rice krispie treats. The addition of the peanuts and caramel must bring them to an all new level. This recipe is on my "to make" list. We have had a touch of fall here on the MS Gulf Coast, but you know that doesn't last long. I am longing for cool, crisp fall days. You set the prettiest tea time trays Kitty! Kitty, I've missed visiting you for tea time lately (working long hours). Glad to be back. These treats look scrummy! such a lovely teacup..and your adorable vase and tea pot are perfect. What a beautiful teacup from Debbie! Are you doing the current exchange? Stephanie has 150 participants!! Anything with chocolate and caramel in it has to be delicious! Glad you are getting cooler temps. We are too, and I just love this fall-ish weather. I love anything with caramel! The teacup, vase, and pitcher are charming Kitty. Thanks for sharing with SYC. My sweet friend, your chocolate and peanut treats look ever so tasty! And there's caramel on them....even better! Thanks for sharing with Roses of Inspiration! Have a wonderful week, dear Kitty! Hugs!